We start out sick in bed late at night. Click on the remote by your bedside. Click on the TV. We're in another dream world. We start in some girl's bedroom. The door is locked. Examine the clock. This will be important later. Examine the drawer right of the bed. Take the key north of all the junk. Click on the door to unlock and click again to exit. We're in a workshop now. Examine the knob lock on the right door. Use it and it falls off. Pick it up off the ground. Take the glue next to the paint cans on the left bottom shelf in the back. Examine the knob lock again. Click to apply glue. Click again to apply knob. Do not click a third time or the knob will fall off again. Head back to the bedroom, left door. Examine the clock and watch...time...pass...by. A hand falls off the clock. Nothing we can do about it. Back to the workshop. Examine the knob lock again. Click to unlock the door. A woman enters the room. 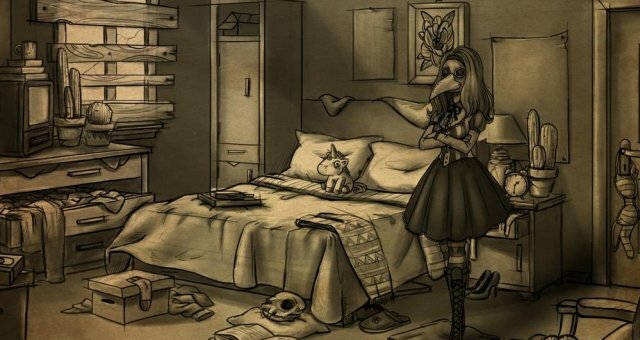 She's wearing a plague doctor mask. She tells us that the outside world has been infected with a virus. Apparently corpses are filled with blue ink. We're the only two survivors so far and she needs are help to cure the infection. We need to prepare first. We'll need a means of staying in contact. Back to her bedroom. There's a walkie-talkie on her bed. click on it. It needs a battery. Examine the drawer where you found the key. A battery is left of the junk. Take it. Click on the walkie-talkie to put the battery in and again to take it. Back to the workshop. She found the other walkie-talkie but it's broken. Examine the walkie-talkie. Click on it. We'll need a screwdriver. One is left above hanging with other tools. Take it. Examine the walkie-talkie and click to start taking it apart. Click inside to move a loose part and click again to take out a faulty wire. There's a spare in one of the boxes. Click on the box next two chemical bottles one the second right shelf in the back. Oh no! SPIDERS!!! Yes, spiders come out of the box and start crawling on the screen. Use the spray on the workbench to your left a few times and the spiders go away. Examine the walkie-talkie. Open it, place the wire in, and use glue and put the other part back in its place. Put the casings back together and screw it shut tight. Head out the right door. We are now in front of a condemned building in a construction site. Click on anything. She can't see what we're doing. We'll need a camera. Go through the fence door on the right. We're in front of a bus stop. There's a camera on the bench, but deadly ink is dripping over it. Head to the left street back to the construction site. Use the beam to move the camera then take it. It's broken. UGH!!! Head into the toy shop on the right. Creepy toys everywhere. In front of the Elephant and girl doll is a rolled up map. Try to take it and the doll won't let you. Click on the elephant and thenquickly take the map. Exit. The right side of the screen of the bus stop let's you use your map. We can travel now. Back to the girl's house. She's impressed we managed to stay alive out there. Give her the camera. Apparently it's not broken. It just needs a videotape. Go to her bedroom. The videotape is on the right edge of the screen on top of a box. Take it. Back to the workshop. Use the videotape on the camera. Talk to the girl. Click on the camera. Look at the TV screen and move your mouse around. Before we can develop a cure, we need an infected blood sample from a fresh corpse, we'll also need gloves, a mask, and a syringe. Enter the left door on the right to enter the bathroom. Open the mirror cabinet above the sink. There's a something we can use as a mask hanging over the shelf. Take it. Exit and go outside. There's a perfectly good pair of gloves right above. Click on them. They're too high. Click on the spot in front of the shovel to grab a stone. Remember that spot. You'll be coming back to it a lot. Use the rock on the gloves and take them. Grab another rock from the dirt while you're here. Exit right to the map. Oh my god! What is that thing! It took the corpse away and disappeared! Now exit to the map. We're now in the city park. What do you know? A fresh corpse sitting right there! We'll need a syringe. Go forward. A picnic area. Click on the gate. Jeezus, that thing again! Well, this is a dead end. Go back. Click on the corpse. The cigarrete falls out of his mouth and lights some drawings on fire. Examine the drawings. Only one portion still intact. Click on the window. Too high. Go back to the construction site. There's a small ladder leaning against the wall on the right. Take it. Head back to the alley behind the school. Put the ladder on top of the dumpster. Click on the window. Locked. Break the window with a rock. Go inside. We're in the school bathroom or water closet as it is named in Europe sometimes. W.C. Our rock issurrounded by the broken glass. Pick it up. Perfectly good syringes to the right. Pick one up. It's dirty. What's worse is ink one the door is blocking our way to investigating the rest of the school. Head back to the construction site. Examine the bottle of water on the ground. Use the syringe with it. Click on the bottle. It's clean. Take it. Go back to the park. Give her the blood sample. She will analyze it but needs some time. We'll need to patrol some sites. Ink blots are covering a spot on our map. To her bathroom. Use the cleaner on the dirty spot. New location revealed: Downtown! We don't need to go there just yet. Head back to the school bathroom. Use the cleaner on the ink on the door. Grab some toilet paper in front of the toilet and then wipe the ink away. Go through the door. We're in the school hallway. Examine the open locker on the right. Hey, a little figurine of the Butcher from Bad Dream Coma. Nice! Go around the corner to the left. Huh? the detail is dropping quality further down. What is going on? Click on the locked door to the left. Ready to rock? Smash the window. Go in. It's dark so click around until the light switch is found. Welcome to the janitor's closet, where the guy apparently took his smoking breaks. Click on the toolbox on the shelf in the back. The girl needs more tools. Take the crowbar on the left. There's a chisel next to the boot on the left. Take it. The pliers on the right above the desk. Open the left cabinet. There's the screwsriver in that tin can. Take it. Knock over the wooden stool. Click on the boxes. Move them to the desk area. Take the saw. Saw off the stool leg. Take the stool leg and use it on the thing on the boxes to the right. A makeshift hammer! Take it. Move the chemical bottle on the right on the desk and move it between the poison and the boxes. There's our wrench. Take it. Leave. The bathroom door is covered with ink scribblings! Click on the eye above the lockers. Keep clicking on it. Eventually, as the shade detailgoes away, so does the scribblings. Enter the bathroom. Him again! The exit is scribbled out. Close the eyes by clicking on them. One on the right stall and one between the left and middle stall. Exit. We are now in front of a bookstore, a clothestore, and a boarded door. The exit to the map is to your left. Go right around the corner. We're in front of a coffee shop, an art gallery, and an ice cream stand. The coffee shop is the only one open so go in. Oh, we got some paranormal activity in here. On the counter to the right is a tip jar with a coin in it. Take it. Exit. Between the bookstore and the clothestore is a newspaper dispenser. Go ahead and spend your money on a copy of the news. Maybe we'll get some info as to what's going on. Examine the newspaper. Monster in the lake? Either it's a slow news day or something worth investigating back at the park. Go ahead and use your crowbar on the boarded door. After breaking two planks, the crowbar is broken on the third plank which is still up. Pry it off brute force with your hands. Go in. We're now inside what I think is some apartment complex first floor. Ink blocks the upstairs so examine the padlock on the wooden door. Try moving the numbers around. Needs oil. Go back to the toy shop back at the bus stop. An oil can is right next to the cash register. Take it. If you need a stone, go back and get one at the construction site right now. Head back to the apartment complex. Examine the padlock. Use the oil can on it. The girl will now tell us the code: Use the hammer. Can I just say I really like this girl? Go in. We're in some kind of storage room. Move the rake to the left side of the cabinet. Move the boxes to the left area on the floor. Open the drawer of the cabinet. It's a children's activity book. For the maze, click on the red x and move the mouse through the maze. Do not let the tip of the mouse touch the maze's walls. When you reach the end X, click on it. For the pictures, click on the cloud (bottom picture), the chimney and sun (top picture), and whatever is on that torn off corner piece. Go back to the lake at the city park. Toss a stone into the water. Oh no, that was stupid! What have we done?! Close the eye on the canvas. Head back to the park. You do not want to find out what happens if you let those bubbles reach the shore. That thing again. It's just standing there...MENACINGLY. Click on the pine tree to the left to exit to the map. The blood test results are in. It's pure ink? A prototype of the medicine has been made but we'll need some supplies. With the phenomenon happening at the park and school, the girl hands us an alarm clock. It should attract the anomaly from one place to another. The alarm clock needs to be fixed with the items we need to find. Go to Downtown. Click on the ice cream stand. With most of the town dead, ICE CREAM IS FREE! Click on the cone dispenser and then the lemon ice cream dispenser. Go into the coffee shop. Put the lemon ice cream on whatever is on that table in the middle. Take the tip jar. Use it to collect the lemon juice from the ice cream. Go back to the apartment stairwell. We're in some bedroom. Move the empty bottle on the floor to the side. Move the books on the bottom shelf to the left of the bottle. Move the last book on top of the other books. Take the piece of paper and put it on top of the book on the bed. Open the pizza box for another piece of paper. Put it with the other. Move the middle posted document above the computer to the right to reveal another piece of paper. Put it with the others. Click on the tape nearby to put them all together. Examine the paper. A potato battery! Plug in the computer. Exit. It's that thing again! It disappears without doing any harm. Take a potato from the spilled bag of potatoes on the right. Click on the box you didn't move. Spiders. Go back outside. Take the empty bottle you used on the syringe. Grab another stone. Head back to the girl's house. Use the spray on the box. Move it to the left of the cabinet. Examine the right drawer. Take everything you see here. Head back into the apartment bedroom. Move the chair aside. Use the CD disc on the hard drive. Examine the computer. It's Bad Dream: Butcher! In-game: Head right. Head right. Head right. Into the tunnel. Take hammer. Head right. Head left. Head left. Head left. Into the tunnel. Head left. Use hammer on skull. Head right. Head right. Head right. Head right. Use key on door. Go in. Take meat cleaver. Exit. Head right. Use meat cleaver on stick person. When he's gone, head right. Go through double doors. Click on door. Game abruptly ends. The fuse box is on the fritz. Exit. Examine the alarm clock. Use the potato, the nail, the screw, and the wires. Head back to the girl's bedroom. Examine the alarm clock. Use the hand on the clock. Use the alarm clock. The phenomenon starts happening as the alarm rings. There's nothing you can do. Nowhere to run or hide. We're still alive? Downtown is closed off. The park and the school are available again. Go to the park. Check the paint box next to the canvas. No white paint. Check the nearby junk pile sticking out of the lake. Take the white paint tube that's there. Go to the picnic area. Use the empty bottle on the champagne glass to get a bottle of alchohol. Go back to the school. Examine the backpack there. Take the eraser sticking out. Go to the alley. She's not here. Check the bedroom door. A scream?! A monster growl?! Hurry! Into the bathroom! Oh, she was just watching horror movies. Well, let her know we have all the ingredients. Exit. Talk to her about combining the ingredients. After a fade in, fade out, the mixture is ready. We need to do a field test. Head to the bus stop. Use the vaccine prototype on the ink spot on the ground. It works! Remove the stains on the trash can and the bus stop roof. Go into the toy shop. Examine the tabletop. Use the vaccine on the ink bottle. Crap! The ink is too strong in liquid form and we got some on us. Exit. We're here in the workshop. The girl washes the ink stains off of us. We're clean, but the ink might've altered our mental state. We'll need a clean blood sample to do a comparison with ours. Head to the lake. Check the thing floating in the water. Examine the floating junk pile. Take a hook. Take the end of the branch hanging above. Use the fishing rod on the floating object. It's a body! Examine the body. Take the key in the pocket. Head to the Art Gallery right of the coffee shop. Examine the pirate painting. It talks! He wants a drink. Examine the spots where missing paintings used to be. Take the piece of paper in the corner. Exit. The city gate is locked. Examine the bag. Take the oil painting inside. Go back to the Art Gallery. We're in a classroom. Take the magnet on the chalkboard. Take the sponge on the left desk in front. Go back to the coffee shop. Use the sponge to clean up the coffee spill on the back right table. Take the oil painting underneath that table. Go back to the Art Gallery. Turn the lever on the well. The end of a rope comes up. Use the magnet on it. Use the lever two more times. We got a coin. Take it. Go to the lake. Examine the box filled with art supplies. Take a paint brush and some black paint. Paint on the canvas. Take it, it counts as an oil painting. Go back to the Art Gallery. Put the painting on the wall. Paint a liquor bottle for the pirate. The pirate is pleased and gives us a treasure map. Go back to the Bus Stop. Check the trash can. There's another oil painting in there. Take it. Go to the construction site. Check the treasure map. Take the shovel and use it on the stones placed to form an X. Examine the treasure chest. Another oil painting. Take it. Take the moneybag as well. Go back to the Art Gallery. Hang the paintings on the wall. Examine them now that they're all here. Screenshots from Bad Dream: Coma. Take the painting with the Butcher on it. It's got blood as well. Go back to the Girl's House. Give her the bloody painting. Now we wait. She has a theory, but to test it, we must break the laws in force in the world. Go back to the school classroom. Using the equation on the chalkboard, Change the symbol to divide and the second number to 0. Congratulations! We've started the apocalypse! The world reboots itself. We're in a virtual world. We must now find the author of the game world and convince him to restore a previous version of this game before the ink virus took over. Pause the game to where you can see your equipment. On the bottom right menu is Authors. Click on it and look above. "Adahn". Click on it. We'll need a phone book. Click on the eye above the door. The author must be watching. There are eyes everywhere as you exit. Go back to the bus stop. Click on the phone booth. We get a message. "NOT READY YET!" Luckily, the girl has been fiddling with the game's code. She initializes a new game mode. Check the inventory pause screen again. On the bottom right menu is multiplayer. Click it. Apparently it's scrapped, but we can try to restore to a usable state. Go back to the apartment stairwell. Check the fuse box. Take a cable. Pause and try the multiplayer option again. Use the cable on the severed wire. Now click for Multiplayer Game: Yes. Resume. With extra cursors going all over the place, this will distract the author. Go back to the bus stop. Open the phone booth and click on the phone book. The author's address is outside of town. Go into the Toy Shop. It's locked tight. Examine the faded space to the left of the gate. Go back to the storage room. Place the device on the faded space left of the gate. Examine it. We need to input five coins. Use what coins you've collected so far. We only need one more. Go back. Someone broke into the clothes shop. Go in through the broken window because the door is locked. It's the masked man from Bad Dream: Coma. He goes into the left dressing room. Open the right dressing room. Take the key that's there. Use it to unlock the entrance. The girl comes out of the dressing room. wait, WHAT?!!! Apparently it was disguise or something. Some stuff about creating perfect characters. She heads for the exit and trips the security alarm. She goes over to the control panel and breaks it. It doesn't work. Exit. The alarm is so loud, we risk having exposed our locations to the author. Back to the girl's house. Talk to her about the alarm. We're on our own. Examine the mannequin in the corner. It'll buy us some time if the other decides to make a move against us. The author seems to like assets from the previous game. Pause the game and turn the sounds off in the options menu. Head back to Downtown. No alarm. Excellent. Enter the clothes shop. Examine the paper right of the cash register. The security code is on it. 2910. Examine the paper left of the register. The last coin, but we can't get it now. Examine the control panel the girl busted. It's broken beyond repair. Go back to the apartment 1st floor bedroom. Examine the broken control panel. Connect the calculator to the wires. Click to umput the code. Go to the options menu and turn your sounds back on. Take the coin left of the register now. Go back to the City Gate. The front doors are locked. Use a rock if you have one to smash open the door window. The girl reminds you of your goals. Go into the Author's home. There he is. The author states that the game wasn't ready yet. He's still working on it. The game reboots again. We're outside his home and the door's been blocked by an ink scribble. The world starts shaking. Exit to the map. All locations except the Author's neighborhood have been scribbled out with ink. Go back to the Author's Neighborhood. Examine under the bench at the bus stop here. Take the used gum. All of our other items have been scribbled out. Examine the thread tied to the car. Put the gum on the tooth tied to the thread. Grab a glass shard on the sidewalk in front of the bench and use to the cut the thread. Take the tooth on a string. Examine the sewer lid. Use the tooth on a string on the hole. Keep clicking until you pull up a coin. Use the coin on the phone booth. Use the phone to contact the girl. The conversation gets cut off by a lightening strike. The phone has been severed and it starts to rain. Take the car antenna off the car. Use it on the phone for a makeshift Walkie-Talkie. Continue the conversation. We need to get back to her hiding place. Click on the frame on the sidewalk in front of the bench. Examine it. There's part of a map. The bus stop. Click on it. We're close but all the main roads going through the map are destroyed. We'll have to go through the sewers. Close the phone booth. Head left to the construction site. Take a rod out of the rubble in front of the condemned building doorway. Grab another stone. Head back. Click on the locked chest to move it. A magnet on a rope comes down onto the chest. Climb the rope. We come out of the well. We're at the picnic area at the city park. Head back down the well. Open the chest with the rock. Take the crowbar inside. Use the crowbar on the locked door. Go in. SEWER GATOR!!! We need to feed it to make it go away. Make your way back to the well to the picnic area. Put the fish on the desk. Click on the poison bottle. Take the poisoned fish. Go back to the sewer gator. Let's see how it likes this. Feed it the poisoned fish. It dies. Go through the tunnel. The girl has another solution. She's written a program that will take control away from the Author. It's on her computer. We'll have to wait until it's finished. Something happens and ink starts appearing on her. She goes to wash it off and then ink starts appearing on the objects left of the screen. She returns. She's out of cleaning products. She starts feeling weak. Ink scribbles out more and more objects. After a little while, all we can do is escape. We're at the city park. The girl has suffered from the ink problem for some time now and now she has no cleaning products to wash it off. The ink was improving her form. The author kept trying to change her. He did the same to everyone else until their bodies couldn't handle it. She gives us a CD with the program to take away the Author's control. We just need to find a computer. Go down the well at the picnic area. We're at the coffee shop and Art Gallery. Make your way back to the 1st floor apartment bedroom. Use the CD on the hard drive. The Author appears on the computer screen. He's thinking of turning the game to an MMORPG with 3D Graphics, Zombies, randomly generated levels, and a crafting system. The computer breaks. The Author is mad and overworked. We'll need to repair the equipment so we can launch the program again. Go back to the clothes shop. Take a piece of the broken glass on the floor. Go to the ice cream stand in front of the coffee shop. Cool down the hard drive with the ice cream. Take the adhesive tape on the bed. Fix the monitor. Use the CD with the hard drive again. The game is altered. Now we have to eliminate security locks. Just follow the signals as they appear. If no signals appear, check the sewer map by going into the sewer. Stay calm, you'll do fine. The Author steps in. He is not happy. He's hellbent on improving everything with insane perfectionism. We can now check out his office. In the Author's office once more, take the torn piece of paper near the trash can and the other left of the room on the floor and put them together on the desk near the tape. Use the tape. Put the whole paper on the bulletin board. Examine it. A scrapped location. Take an empty can. from the pile of cat food cans. The cat needs food. Take the glitching paper in the middle of the ground. When the screen is back in focus, check the options menu again. New option: Other. In your inventory is a can label. We need bird, mouse, and fish meat. Click on Other. Turn on Horror mode above. Now everything has the tint of a Bad Dream game. Go back to the Janitor's closet. 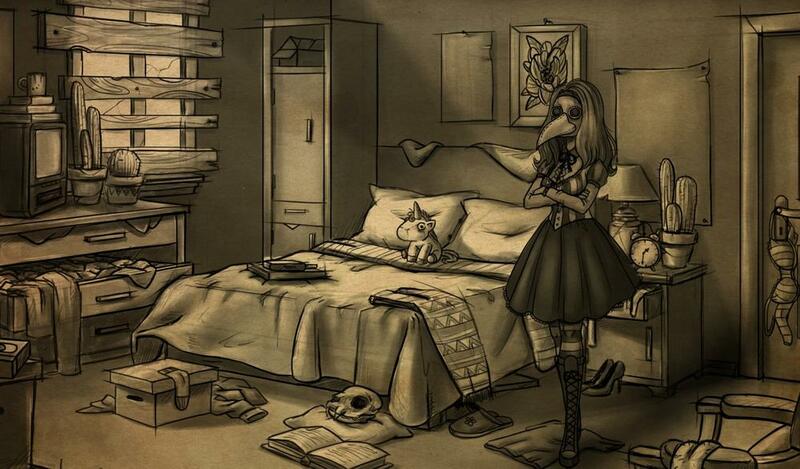 Examine the dead bird. Take the dead bird and the fish in its mouth. That robot mannequin thing appears again. The dead woman is scribbled out. Put the empty can on top of the gas tank. We'll need a match to light a fire to cook the ingredients. Head back to the alley behind the school. Light the fire and put in the ingredients. Take the can of cat food. Go back to the scrapped location in the Author's office. This location is full of holes and a flame in the middle. Take a piece of a figurine out of the backpack. Go back. Take the glue on the desk next to the computer. Head back to the hallway lockers in the school. Examine the open locker. Glue the arm back onto the Butcher figurine. Take it. That being comes back and scribbles out the bathroom. Head to the construction site. The Author is there. Talk to him. Apparently, our meddling has caused the game's editing system to go out of control. Talk to him. Still obsessed with perfecting this game. He moves. Talk to him some more. He mentions the girl who escaped him and going to finish the school lobby. Go there. He's started on replacing the old art style of this location with the new one. Go to the alley. Take the part of the drawing in the pile that is still usable. Head back to the Author's office. Place the Butcher figurine on the shelf above and it collapses. Take the rolled up paper and place it on the bulletin board. Examine it. Put out the fire. The room needs to air out the smoke. Place the part of a drawing on the hole where the window should be. Take the glitching paper on the floor. Another option in Other has been made available. Violence and Blood, switch it to No. Everything's normal again. Head for the city park. At the picnic area, the editor bot can't do much about our presence. Go back to the park bench and see how the girl is doing. She's dead. Our only companion, dead! Oh WHYYYYYY?!!! The editor bot scribbles her out. Head to the picnic area. We're in a landfill. This is where they've taken all the dead bodies filled with ink. After a while, the Author arrives. The Author created this world and enjoyed it until he became indifferent. He began to see bugs and glitches everywhere. He created editor bots to correct them only for him to go mad with power. His standards were to high so theirs became as well. It was like a virus. He began thinking the project was useless as he continued editing the game over and over. He gives us an unsigned CD from the piles of old CDs. Head back to the Author's office. Put the CD in the hard drive. An editor bot appears and disappears. Examine the computer screen. Well it's certainly changed a lot. Lots of things are scribbled out. Go forward. It's the man in the mask. He says he will erase us if we don't leave. This dream will become a nightmare. An editor bot appears and scribbles out the man, but he erases the scribbles. He asks what's going on and he's pixeled out of existence. Go back. Darkness, silence, and then scribbling. We're in an open grave. The man in the mask is here. Climb out. The editor bot destroyed everything. We brought it into this world so we must help the masked man get rid of it. We must get to the hospital. If you've played Coma, you should know your way around. Head for the cementary gate. It's scribbled out. The masked man says the editor bot scribbles out every place it goes. He shares a piece of his eraser with us. Erase the scribbles on the gate. Go through. The doors and windows are scribbled out. The masked man goes to look for survivors. Erase the scribbles on the doors. The editor bot is there. After it. There's a plug and cord around the corner. Take it. The editor bot appears and tries to scribble us out again. When cursor changes to the eraser piece, click to make the scribbles go away. Go back to the reception desk. Click on CD and then Bridge. Once it's finished installing, click Antivirus. No threats detected. Click OK. Click on Games folder and then Bridge. Autocorrect? Oh no, try to close out Bridge. Autocorrect installed. Click Antivirus. Spam click if you have to. The virus is removed. Click OK. The masked man comes to the conclusion that it was the Author's doing. People are satisfied with Coma as it was. The Author's madness has ceased. Things should return to normal. The game...video...guide...whatever finishes. Click the play button symbol. We're back in the Girl's bedroom. Do what you did in the beginning. Find the key, unlock the door, and Exit. Examine the lock on the right door. Click the lock. Click the door to knock. A letter slides through. Examine it. It's from the girl. She gives us her thanks that everything is better again. Her name is Ella. Everything fades to white. Out of the TV screen, we're back in bed.